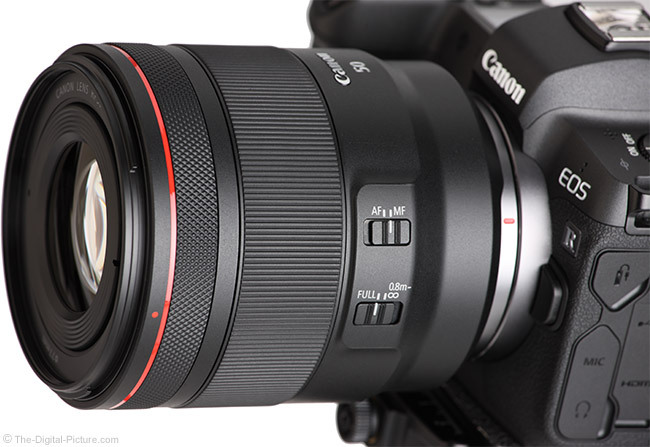 Image quality test results have been added to the Canon RF 50mm f/1.2L USM Lens page. Canon didn't hold back with the quality level of its initial lens selection for the Canon EOS R and the new RF 50mm f/1.2L warrants attention. This lens is well-built, looks great, focuses quickly and with the R behind it and a little contrast in front of it, this lens focuses in ridiculously dark scenarios even when I cover the focus assist light (it is very impressive). I need to talk about the EOS R image quality a bit to clarify the results we are seeing from this lens. This EOS R vs. 5D Mark IV image quality comparison should be a decent one. These two cameras have the same resolution and the compared lenses, stopped down to f/5.6, are both very sharp with little distortion. What you will immediately see (and I think you are going to see this corroborated in forthcoming test results) is that the 5D Mark IV's image is sharper. While it immediately looks like the 5D IV is delivering better image quality, that is not necessarily the case. We have long been using a low Canon Digital Photo Professional sharpness setting of "1" (on a 1-10 scale) for lens testing as sharpening quickly masks differences between lenses. While it seems that increasing the sharpness of an image is a cheap fix to poor lens quality, that sharpening quickly becomes destructive to details, ruining the fine image quality you were seeking in the first place. Camera manufacturers know that you like sharp images and they crank up the default sharpness in attempt to make you happy. Nearly always, that setting is at a very destructive level. Fortunately, you can adjust the sharpness level to your taste. There is a long pipeline between the imaging sensor and the final image file and not all cameras utilize identical hardware and software (more often, they do not). More specifically to the point, the amount of sharpening showing in a final JPG image processed using the same settings is not always the same. And, that is the case here. If you zoom in your browser while looking at the 5D IV result, you will see some slight over-sharpening halos, slightly brighter colors around the border of the darker ones. I gave strong consideration to using a sharpness setting of "2" as the default for the EOS R, but the halos began showing at that setting. So, we are staying the course with the standard sharpness setting of "1". You of course can increase your sharpness setting as desired. A setting of about "2" approximately matches the 5D IV. Download the crops shared here and apply your preferred sharpening routine. This might be the 50mm lens you've been waiting for. The Canon RF 50mm f/1.2L USM Lens is available for preorder at B&H | Amazon | Adorama | WEX. Here are all of the EOS R, RF lens and accessory preorder links.